Cauliflower is in season now... and its quite cheap. This lovely meal is a favourite among us. 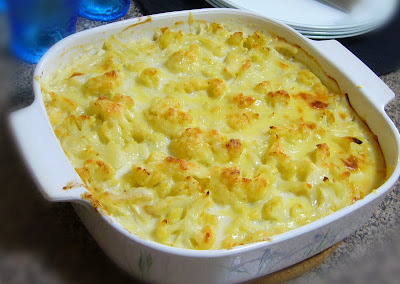 First time I had this cauliflower bake... when I was student on a budget... some 20 years ago. A good winter warmer lunch with hot chocolate at the Student Union Cafetaria.....overlooking River Thames.... good old days!! Melt butter in a saucepan, saute the onion and garlic until soft. Stir in the flour. Add milk and keep stirring. Add bay leaves. Bring the sauce to boil until thickened... add cheese. Salt to taste. Add in cauliflower. Put the mixture in a baking dish. Sprinkle with cheese and bake for 40 minutes or until the cheese melted. Bake at 180C..